Seasoned marathoners share the wisdom they wish they'd known before their first big race. 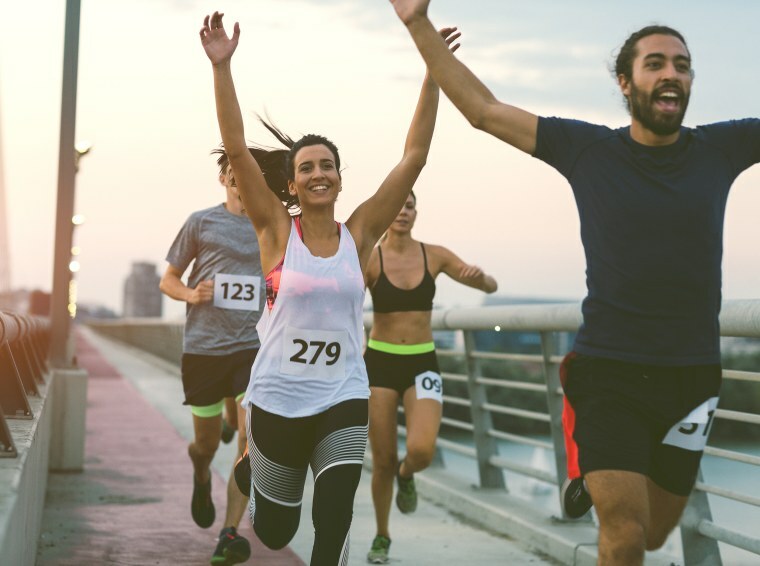 Perhaps you were inspired by stories from the New York City marathon last month, or running a turkey trot has you setting your sights on a loftier goal. Or like many, the annual surge in motivation that comes with waving goodbye to one year and entering another may have a longer race or marathon on your resolution list. The majority of those who have successfully checked the marathon box will talk about a feeling of accomplishment like no other — but they don’t sugarcoat how challenging the road to completion can be. Luckily, those who have been there, done that have accumulated some wisdom that can save you from having to learn the hard way. We asked a handful of long-time marathon pros what they wish they would have known going into their first big race. Here’s what they had to say. Before registering for a race, assess your current fitness level to determine if you have enough time to adequately train. Even serial marathoners train extensively for each race. Graham adds that while all marathons are the same distance, each is drastically different when you take elevation into account. By knowing where the hills are, you can get strategic by planning for them during training, and by knowing when to walk uphill to prevent leg burnout. Walker dedicates each of the last six miles to special people in her life, which helps to divert attention away from tired legs. In addition to the physical hurdles, you will undoubtedly hit a few mental walls; it’s common to have negative thoughts, discomfort and even pain while training and racing that can hinder our motivation. Walker says that it’s important to proactively nip these thoughts in the bud.“Don’t beat yourself up over a bad training run. Marathon training is a microcosm for life. Not all will go as planned,” she says. “Remind yourself that training for a marathon is a long process. Your fitness level will progressively improve if you keep at it.” On the day of the race when the going gets tough, Walker dedicates each of the last six miles to special people in her life, which helps to divert attention away from tired legs. Serial runners say to keep your marathon shopping simple. “There are many fad shoes — minimalist, individual toes, super padded — but those are just fads created to sell more shoes,” says Graham. “When I first got into running, I wanted to try the minimalist shoes with individual toes. The company claimed it was more natural, but personally I found that I had knee pain any time I ran more than three miles in them. I quickly got rid of those shoes in favor of traditional shoes.” Bottom line: Stick with the basics and don’t get swayed by trends when investing in a pair of sneakers. Spend the money you’ve saved on apparel and buy some anti-chaffing supplies. Mayes says he learned this the hard way after running the Marine Corps Marathon. “After the race my inner thighs, under arms and around my neck were raspberry sorbet red and itched and burned like poison ivy,” he says. Long-distance runners come in all shapes and sizes, but one factor they all have in common — outside of fierce motivation — is their feet. Walker is no stranger to the beating your feet take when logging 26 miles; she says her toenails “have become disfigured and some have turned black” due to bruising. Before race day, make sure your toenails are trimmed back, and if you get a pedicure leave the calluses alone since they can provide extra padding and protection. Walker also recommends scheduling a foot massage beforehand. “A good massage therapist will be able to help alleviate tight muscles in the bottom of the feet. This can help prevent one of the most common runners’ injuries, plantar fasciitis,” she says. While it can be tempting to save any new apparel you’ve invested in for race day, those who have been there say don’t. Instead, consider your last few long runs a dress rehearsal for the race. Walker says, “Not only should you try out what you are planning to wear during the race, but you should also practice race day nutrition during your long runs. Race day nutrition includes what you will eat for breakfast, as well as what you will take in during the race.” In that vein, don’t deviate from other aspects of your routine on race day. You want to feel comfortable, relaxed and familiar with everything you’re wearing, drinking and eating. The aforementioned advice also means saying, “No, thanks!” to the energy gels that are often handed out throughout the race course. “Although I finished my first marathon, I did not have a pleasant experience. Part of my race day misery came from using the energy gel that was offered on the course, rather than the gel I had trained with,” says Walker. “I didn’t think it would make much of a difference, but it almost cost me my race. My stomach was that upset.” Mayes had a similar experience: “Upon squeezing the [energy] goo into my mouth, I immediately knew that I had made a mistake. I had to run the second half of the race with that horrendous taste in my mouth fighting back the urge to gag,” he says.